Wheeling is a city of approximately 30,000 residents in northern West Virginia. The city is situated partially in Ohio County and partially in Marshall County. Wheeling was the first capital of West Virginia. 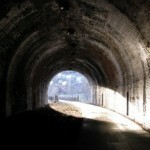 The Tunnel Green, more officially known as the Hempfield Railroad Tunnel, is located along the Wheeling walking path. Though it was once a railroad tunnel, it is now a pedestrian tunnel. There is an old cemetery located on top of the Tunnel Green. With a little bit of a hike, one can visit this cemetery. According to one resource, a young immigrant worker was robbed and killed by an acquaintance inside the Tunnel Green. Tunnel Green is an old train tunnel. Wheeling locals claim that it is haunted by the immigrant worker who was killed in the tunnel. His ghost is seen floating above the tracks, often with his mouth hanging open as though he is screaming. The apparition is said to cover his face with his bloodied hand, still trying to defend himself from his attacker. Shadow figures have also been reported inside the tunnel.